As discussed in our training, the changes we need to make in how we deliver our service don't just take place because of a single day's training. They happen when our core belief about our role changes and we see evidence of it in the real world. 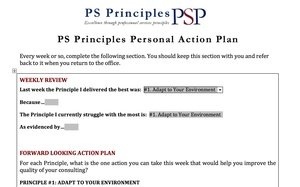 To help us make those changes and see the real-world evidence, use the PS Principles Action Plan. This simple template is something you can discuss with your manager at your next 1:1 that will help you identify a way for you to try something different in the upcoming week. By planning to act differently in front of the customer, you can role play that scenario with your manager and prepare more adequately for the situation. This will help you prove to yourself that these new behaviors are worth repeating. Important: You are free to access and use this material for your own personal use. The material is protected by copyright laws and cannot be copied or distributed. You agree to use the materials under these conditions when agreeing to access the material.